I have always been an advocate of cross training and fitness to optimize ones karate ability and strength. In my competition days in particular (but still today) I always included weights, hojo undo, hill sprints, swimmming and other activities. The below video of Dimitris Triantafyllis ‎(European and World Games Champion)‎ is an inspriration in terms of someone who is ensuring he has fitness, impact power, grappling/throwing and sports karate tool sets. Although this video shows a modern approach, hojo undo was the traditional karate form of conditioning which include resistance exercises, impact, arm (ude tanren) and leg conditioning and is well reviewed in the book hojo Undo (Clarke, 2009). 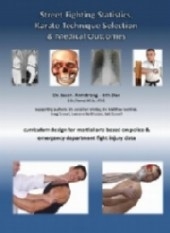 The modern controversy around the possible damage ude tanren does to one hands/arms/legs is discussed from a medical perspective in the book Karate technique selection"& Street Fighting Statistics & Medical Outcomes. Muay Thai is an extreme fitness and conditioning impact fighting art which is also famous for its bone/tissue conditioning. The LaPlante sensei karate video shows a hard "old school" version of conditioning using a tree as a "makiwara". Four videos on plyometrics for speed & power are below. For the physiology and more detail about Plyometric training see the article. The below cover: Plyometrics For The Upper Body Speed/Power 1; Plyometrics For Leg Speed & Power 2; Plyometrics For Upper Body Speed/Power 2; Round House Kick - Mawashi Geri Learning And Stregthening.